This is a delightful cozy mystery that I reviewed last year when it came out in hardback. Now it’s finally available in mass market paperback and it’s still a great read. I’m sharing my thoughts from last year, along with a few new notes about the book. In addition, you can enter to win your own copy (see below). Author Monica Ferris has crafted characters that readers feel comfortable with like neighbors down the street. It doesn’t matter if you’re a first-time reader of her Needlecraft Mystery series or a returning fan, the characters will seem like old friends. Her characters are realistic and intriguing, each with their own unique personality. The story flows smoothly and at a good pace. The twists and turns will hold your attention until the very end. The setting is inviting and comes to life through the author’s eye for details. Ferris keeps the story fresh and entertaining even though KNIT YOUR OWN MURDER is the 19th installment in the series. 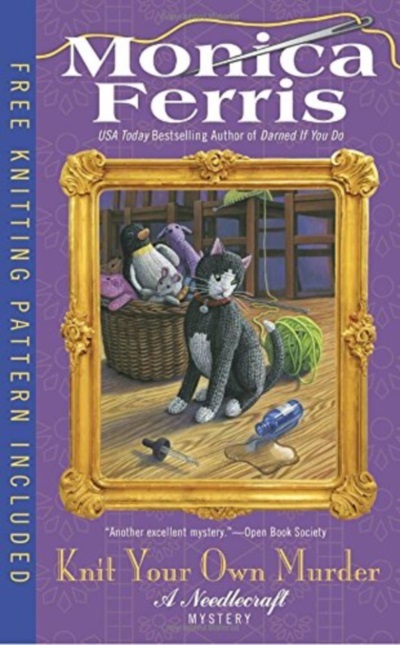 There’s a good mix of suspense, friendship, and humor combined with needlecraft tidbits and a knitting pattern. Non-crafters shouldn’t shy away from the story as the mystery and friends are the focus. This is an enjoyable cozy mystery and readers don’t have to be needlecraft buffs to delight in the tantalizing plot and unique characters. Thanks to the wonderful folks at Penguin Random House, I have a print copy of KNIT YOUR OWN MURDER by Monica Ferris to giveaway. The giveaway is open to residents of the U.S. only and will end at 12 a.m. (EST) on Friday, July 21. Thanks so much for stopping by. Have you ever tried a pattern that was in a book you’ve read? If so, how did it turn out? It sounds like fun. I am a complete klutz where knitting is concerned, but love admiring other people's creations. I'm not much of a knitter so I've never tried any patterns I've seen in books. Knitting a toy in front of an audience - no pressure! I love the needle craft theme for the book; one of my favorite authors. Oh, I remember your reviewing this last year, Mason! A knitting group can be a really effective context for a story, so I can see how it would work very well here. I have zero skills when it comes to knitting, so I don't imagine I will ever try a pattern in a book. But that doesn't mean I can't enjoy a book with a knitting theme! A cozy that is on my wish list, thank you for the chance to win a copy. I don't knit, my 'product' always ends up with holes in it, but I do crochet. I cannot knit but the book sounds captivating and special. I can't knit either. Which is a shame, because every time we'd vacuum, I'd swear I could knit a new cat with all the fur we'd pull up. I have never tried a pattern from a book I've read. Have been wanting to learn to knit and crochet. However, I have tried recipes and had good results. I do enjoy Monica Ferris's work...I am very intrigued by your insights. I'm not one to knit and crochet, but I do love my thematic cozies!